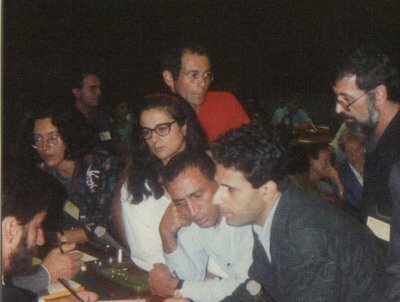 Sorting out a procedural wrangle with the chairman at a UN conference of NGOs in Vienna, some time in the late 1980s. In the foreground is Meir Vanunu, Mordechai's brother, who did a lot of campaigning for him back when not so many people were. Next to him, the thinker resting jaw on elbow is Black Panther leader and Knesset member Charlie Biton. Behind him, the woman in white with glasses is Simone Bitton. Like Charlie and Meir, Simone's family too hails from Morocco, though she lives in Paris. The woman on the end of the group is Amira Hass, then just a socialist militant, now better known as the Ha'aretz journalist who went to live in Gaza and then Ramallah, from which places her despatches have won wide respect - and opprobium from her country's right-wing Establishment. This group, all more or less non-Ashkenazim (Amira's mother was a Sefardi from Sarajevo) had just come buoyed from a very succesful meeting with Palestinians in Toledo, Spain, and they didn't want any bureaucratic tangles at Vienna to clog up further progress. Anyway, my excuse for showing off my snaps is that Simone Biton's highly-acclaimed 2004 film Mur (Wall) is showing in the London Jewish Film Festival. The blurb says "Wall explores the physical and psychological dimensions of the controversial barrier being built to divide Israel and the Palestinian territories. Acclaimed documentary filmmaker, Simone Bitton, travels along the new construction of this long barrier, interviewing both Israelis and Palestinians who live and work beside the wall. The film effectively visualises the meaning of an impermeable barrier to the local communities while the interviews produce a contemporary and poignant account of the conflict. Wall, winner of numerous prestigious awards, is a contemplative journey into the politics of everyday lives in Israel and Palestine, alongside the extended wall of separation". From another source (London Socialist Film Co-op) I learn that Simone has said that in her film "space is essential; the sky, the earth, the landscapes are fully fledged characters". The film is being shown at the Phoenix in Finchley on Sunday 13 November in a 2.00pm double bill, and at The Tricycle, Kilburn on Monday 14 November 6.45pm And if you can't make either screening there'll be another chance, though you'll have to wait. The London Socialist Film Co-op has booked it to show at the Renoir in Brunswick Square on Sunday morning 12 March next year.